Poor oral care can lead to pain, poor nutrition, and an increased risk of additional health problems for older adults. 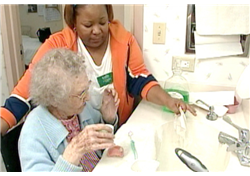 This new video will equip home, hospital, and long-term care staff with basic oral care skills to assess, assist with, and perform daily oral hygiene needs for older adults. The video demonstrates wet gauze cleansing, as well as, the proper techniques to clean teeth, dentures, the tongue, and inside cheeks. It identifies examples of good oral care, examples that need improved care, and specifies sign to watch for and report, such as, bleeding, ulcers, cracked lips or mouth, and redness. Caregivers will also learn how to assist those with special needs, such as, stroke survivors, persons with dementia, or unconscious/unresponsive patients. Applying these necessary oral care basics can greatly improve overall health, and sense of well being for older adults.